Tudumo - Best GTD Software for Windows Getting Things Done with Tudumo – MillionClues! In a TED Presentation, David Pogue says how Simplicity Sells when it comes to Software design. I think Tudumo is just what simplicity is meant to be. I can say that because I actually sold a copy of it. Tudumo is a To-Do list maker. 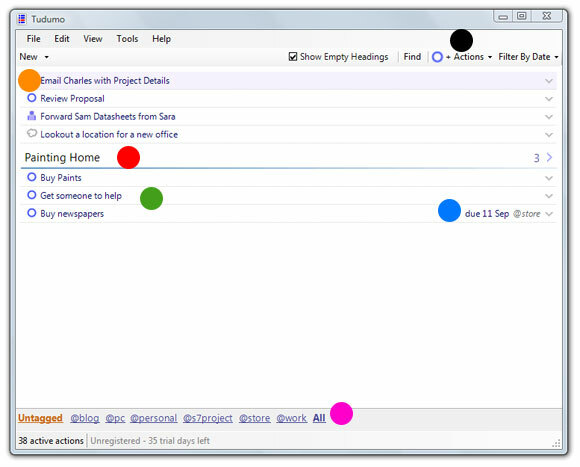 It is a clean and elegant way to manage your tasks. To start with, head over to Tudumo.com and download a trial copy. Unlike many other trial software’s, you don’t have to wait for a splash screen and you are not reminded about registration. For 60 days, you can use the whole full version of Tudumo as good as a registered one. Tudumo uses Headings and Tags to organize the list. You can add all the actions (tasks) related to a specific project under a heading, for instance, and all the things you got to buy from the store under a common tag. The software installation comes with some sample headings and tags and some shortcut tips. The help is also simple, yet comprehensive. There are some easy shortcuts to deal with all the tasks. The Quick Add Shortcut (Win KEY + Ctrl + T) is amazing; a small window pops up – add a task and tag right from there. Anything followed by @ in the quick add window is considered as a tag. Another thought out shortcut is the Esc key. Pressing Escape key closes down Tudumo to the Task tray, near the system clock. On my Vista Home Premium 64-bit, I had a minor problem. I have set it to start minimized when windows starts, but it just wouldn’t start minimized. For $30 a copy, its well worth an investment. Try it out, I bet you will like it. Do you use any similar GTD software? How do you manage your tasks? Glad to see the software I introduced you to has spurred a blog post of its own! I am sure your readers will love it! Nice software, actually I was using ToDoList and MS Notes for managing my work but yes Tudumo is really cool and light weight. Tudumo was my first software of its kind, am lucky, I found the right one! Great this is some thing i really want. I am a Procrastinator (not always) and i forget things too. Tudumo will be really useful for me. Liked the features of it. Thanks Bro for writing about such useful stuffs. I read all of your posts because i like each and every one of them very much. Million Clues is the First site to impress me very much. cool…getting started now..so u got another thing to make people addict on..lol..
Lol, But all other stuffs were free, this is not. But I tell you, its well worth it.